Gravity Road, Mystery Spot, Fool’s Hill. Over the years, this mysterious spot has garnered many names. All of which refer to the same bizarre natural phenomenon that is Magnetic Hill. As if by magic, your car begins to move backwards, pulled up the hill entirely on its own. Even water flowing in ditches nearby has been said to run uphill. How is it possible? How can it be? This strange enigma… this riddle… this perplexing puzzle. How indeed. It is a mystery that has drawn tourists from across the globe since the 1930s. The spot gained fame thanks to Muriel Lutes. She noticed cars could not always make the trip up the hill, and often turned around the way they came – driving away before they could even reach her canteen. This young woman’s ingenuity inspired her to set up a shanty by the top of the hill for business. And boy did it work. In 1933 a journalist came to Magnetic Hill and his story put the site on the map. Since then, it has been a booming tourist attraction. But even before the age of automobiles, travellers would report struggles and strain from their horse and carriage. It begs the question, how long have humans felt the pull of Mystery Hill, and what on earth could cause this occurrence? Seems like a riddle for Scooby Doo and the Mystery Inc. (and of course, the Mystery Machine). So what is the secret behind this natural phenomenon? Is it an optical illusion? A gravitational pull? Magnetic? Magical? Even otherworldly? Perhaps you’ll find the answer at the source. 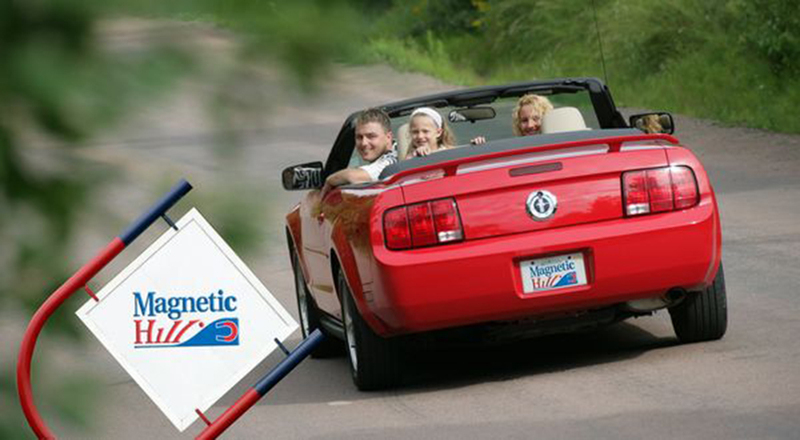 The next time you land in New Brunswick, drive over to Magnetic Hill and see for yourself. After all, seeing is believing (or so they say). The hill is open 24 hours a day, so you can drive your car by any time you please. Guided tours are also available. For more information, visit Tourism New Brunswick, and view their video below to see a relative of Muriel Lutes explain the unexplainable Magnetic Hill.